Ventana Lakes is an active adult community located in scenic Peoria, Arizona. Just four miles from Freeway 101, this 55+ community boasts 30 acres of nine well-stocked lakes, several waterfalls, walking trails, and docks suitable for fishing or paddleboat activities. Surrounded by numerous golf courses, the closest one to Ventana Lakes is Willow Creek. There is a lot more to offer residents of Ventana Lakes than only fishing and golf. The clubhouse provides a large variety of indoor and outdoor amenities. The Ventana Lakes Association is very active and takes pride in taking care of residents, homes, and business alike. Peoria has many shopping outlets, dining opportunities, cultural attractions, and local sporting venues. The clubhouse at Ventana Lakes includes a fitness center and is complete with aerobics studio, sauna and steam rooms. After a healthy workout with a variety of equipment, residents can enjoy a favorite book at the library, or socialize while playing a friendly game of billiards. Arts and crafts enthusiasts and card players have rooms available at the Yacht Club for their activities. Residents who enjoy the outdoors at Ventana Lakes will find friendly competition on the bocce ball and tennis courts, enjoy a game of horseshoes, or even get together for some volleyball on the designated court. Four pools are on hand for comfortable rest and relaxation periods. Two of them are heated for year-round enjoyment. Ventana Lakes in Peoria is comprised primarily of single-family homes and a small selection of attached homes. Construction started in 1986 and ended in 2002, when all 1,701 homes were completed. Houses are now available for sale on a resale basis. The attached homes in Ventana Lakes are situated as single-level duplex or four-plex residences. They range from 991 to 1,287 square feet in size and feature two to three bedrooms, two bathrooms, and an attached garage.There were many single-family homes built throughout Ventana Lakes by multiple builders. These homes offer main-level living and low-maintenance exteriors. Ranging from 1,232 to 2,030 square feet in size, most homes offer two to four bedrooms, two bathrooms, and an attached garage. A full-time activities director schedules monthly bus trips as well as concerts, breakfasts, dinners, dances, karaoke events, and much more. There are also plenty of established clubs already in progress that new residents can join. Some of these are: bingo, bowling, bridge, canasta, croquet, dance, hiking, investment, Italian American, karaoke, Mah Jongg, pickleball, pinochle, poker, quilting, shuffleboard, table tennis, and water aerobics. Ventana Lakes has its own newsletter that is also part of the association website. The newsletter includes a calendar and activities section so residents can stay informed about their community. 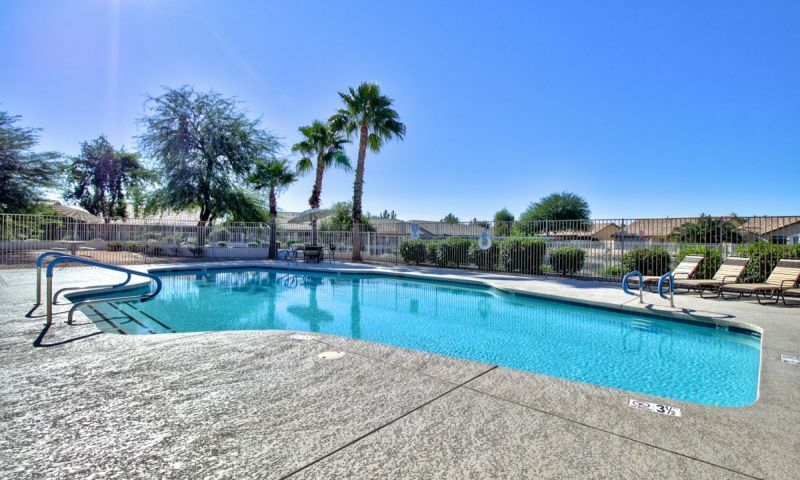 Ventana Lakes in Peoria, Arizona is conveniently located near many shopping outlets and cultural attractions. Within just a few miles drive, residents can enjoy the Arrowhead Mall, West Valley Art Museum, Lake Pleasant Regional Park, Canyon Speedway Park, Challenger Space Center, and the Peoria Center for the Performing Arts. Professional sports teams play nearby, including the Arizona Cardinals. The Peoria Sports Complex also hosts spring training for several professional baseball teams. Easy access to the 101 Loop means residents can be in downtown Phoenix in a quick 30 minutes. Besides large-scale shopping and entertainment in Phoenix, some of the major points of interest would be the Phoenix International Airport and the Phoenix International Raceway. Ventana Lakes is a wonderful community in Central Arizona with scenic views and provides residents with convenience within and outside of the neighborhood. There are plenty of activities available in Ventana Lakes. Here is a sample of some of the clubs, activities and classes offered here. The attached homes in Ventana Lakes are situated as single-level duplex or four-plex residences. They range from 991 to 1,287 square feet in size and feature two to three bedrooms, two bathrooms, and an attached garage. Please note: Due to the age of this community, some attached home floor plans may be missing. There were many single-family homes built throughout Ventana Lakes by multiple builders. These homes offer main-level living and low-maintenance exteriors. Ranging from 1,232 to 2,030 square feet in size, most homes offer two to four bedrooms, two bathrooms, and an attached garage. Please note: Due to the age of this community, some single-family home floor plans may be missing. This is only a 55+ community, lots of amenities, beautiful lakes and great flowers and trees all over. Love living here as do my neighbors. It's been out experience that this is not an exclusive 55+ community. The area however is well maintained and clean. Caveat Emptor. Ventana Lakes has been the perfect community for my husband and I. We wanted something outside Phoenix but still close enough for a day trip. We're about 30-35 minutes from Phoenix but everything we need is right here in Peoria. We like that this community is a lot smaller than most of the huge ones in Phoenix and Surprise. We wanted to feel more like a part of a community rather than just another neighbor. I am very active in the social activities and events while my husband prefers to do his own thing. And here we don't feel overwhelmed by too many options or too much stuff. It's just the right mix and that's probably what we like most. 55places.com is not affiliated with the developer(s) or homeowners association of Ventana Lakes. The information you submit is distributed to a 55places.com Partner Agent, who is a licensed real estate agent. The information regarding Ventana Lakes has not been verified or approved by the developer or homeowners association. Please verify all information prior to purchasing. 55places.com is not responsible for any errors regarding the information displayed on this website.